I swear I was about to comment the same thing!! @manu - mere paas iske alawa aur kya hai?? @naren - obvious is relative!! can u see the profile pic of naren??? Im feeling like tat!!! beautiful photo! where did u see it? Cant believe that you thought about Pythagoras theorem. Correct me if I am wrong but in pythagoras theorem only one angle needs to be 90 degrees. The other two doesnt matter. Here you had dropped the imaginary perpendicular which could have been done, no matter at what angle the tree is (15 to 75). Still the picture looked good. 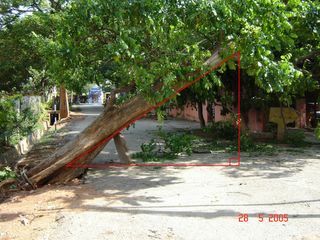 @vaibhav - this was next to the playground very near to my home. @baejaar - LOL, ya everyone is saying the same thing - "how could you have thought of that??!!". Yes, the imaginary perpendicular could have been put anywhere and the angle the tree makes with the ground does not really matter. I just found it peculiar that someone had set the tree up like that. Probably to keep it from blocking the entire road.